On a vibrant New York night in 1997, Lisa Johnson ducked into the Iridium nightclub just off Times Square. A longtime fan and student of rock ‘n’ roll, she was there to hear the weekly gig of octogenarian Les Paul, the brilliant guitarist and inventor whose name — with all due respect to the Fender Stratocaster — graces Gibson’s utterly iconic rock ax. 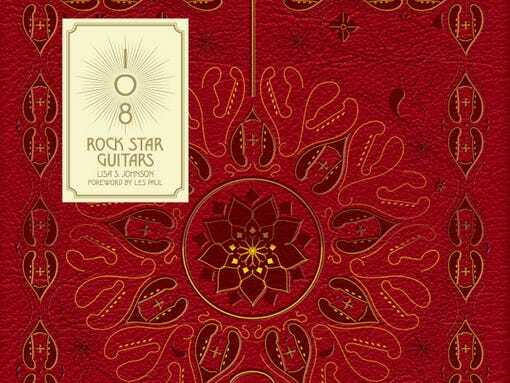 Actually, that was this: 108 Rock Star Guitars, published by Glitterati, is a 486-photograph, $108 leatherette-bound monster of a coffee table book out Oct. 8 ($540 gets you the deluxe signed edition set inside a die-cut box, with a bonus scarf and pick). This doorstop of a tribute showcases the adored instruments of some of the world’s most renowned rock musicians, from Jeff Beck (whose Stratocaster is a hodgepodge of different Fender models and parts) to Willie Nelson (who purchased his now-ravaged Martin N-20 acoustic, named Trigger, new in 1969). The concept is a popular one this fall. Also celebrating stringed tools of the musical trade is Guitar Aficionado: The Collections ($50, out Oct. 15). Leveraging the magazine’s pull with the likes of Eric Johnson and David Crosby, the photo-laden book showcases guitars ranging from Jimmy Page’s 1959 Gibson Les Paul Standard to Rick Nielsen’s 1953 Fender Telecaster. Meanwhile, for those interested in the very roots of the guitar on American soil, there’s Inventing the American Guitar: The Pre-Civil War Innovations of C.F. Martin and His Contemporaries, ($50, out Oct. 15). The book includes detailed photographs of more than 50 seminal old-school instruments, and as the title suggests focuses on the creations and legacy of the Pennsylvania-based Martin Guitar Company, celebrating its 180th anniversary this month. But Johnson’s 17-year-long project is more labor of love than corporate concept. Her journey from shooting her first guitar, Les Paul’s tiger-striped 1980 Gibson Les Paul, to her last, Bruce Springsteen’s battered 1953/1954 Fender Esquire, included a few memorably quick approvals and many initial rejections. “Then I met Rick at a party, and he said sure, just contact his people. So I did, but I misspelled his last name (which alienated his camp). Two years later, I finally got him. Persistence, persistence, I guess,” says Johnson, who wound up shooting a range of kooky Nielsen axes for 108 Rock Star Guitars. Johnson, 49, spent much of her professional life as a technical sales representative for Kodak in Manhattan. In 2000, she was transferred to Las Vegas (“All the photos on the front of slot machines use Kodak product. Big business”). Two years later, she quit and opened two yoga studios in order to delve deeper into the Eastern practice. “All through that time, I kept at the project, usually trying to get ahold of (rockers) when they came through and played Las Vegas, but sometimes traveling to where they were,” she says. In 2008, she sold the yoga studios and pursued the book project full time. Leafing through the book is to trip through rock ‘n’ roll history. There’s Keith Richards’ lovely blond and unadorned 1952 Gibson ES-350, and Yes guitarist Steve Howe’s cherished Gibson ES-175, which “he calls Mr. Gibson and buys a seat for on planes when he travels,” Johnson says. Her two big freakout moments: being in the presence of Springsteen’s Esquire (the banged-up Telecaster-stepchild seen on the cover of Born to Run) and Page’s imposing red double-neck (“Epic,” she says. “Think of how many people that guitar inspired”). And Johnson is only getting started. She is now 35 guitars into what she hopes will be a second guitar-worshipers’ treat. “I’ve got Julian Lennon,” she says excitedly. Speaking of The Beatles, any luck there? But there’s one guitarist even higher on Johnson’s list than members of the Fab Four. But if there’s one legend of the guitar responsible for lighting Johnson’s fire, it’s the late Les Paul.